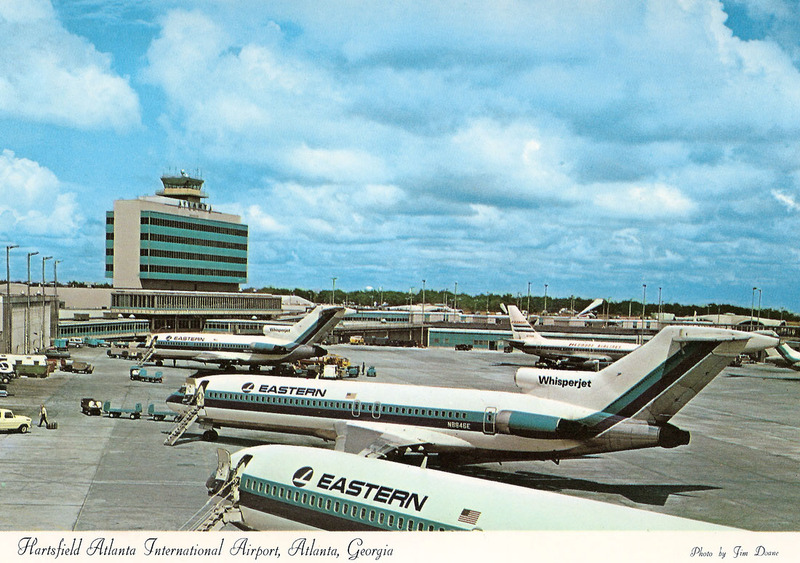 This view of Eastern Airlines 727s parked along concourse B was probably taken 1974-76. Despite Atlanta's ranking as the largest transfer hub in the world and Eastern being one of the largest carriers on the planet, most of Eastern's gates at ATL were never fitted with jetways. The tail of a Delta 747 can be seen in the distance. 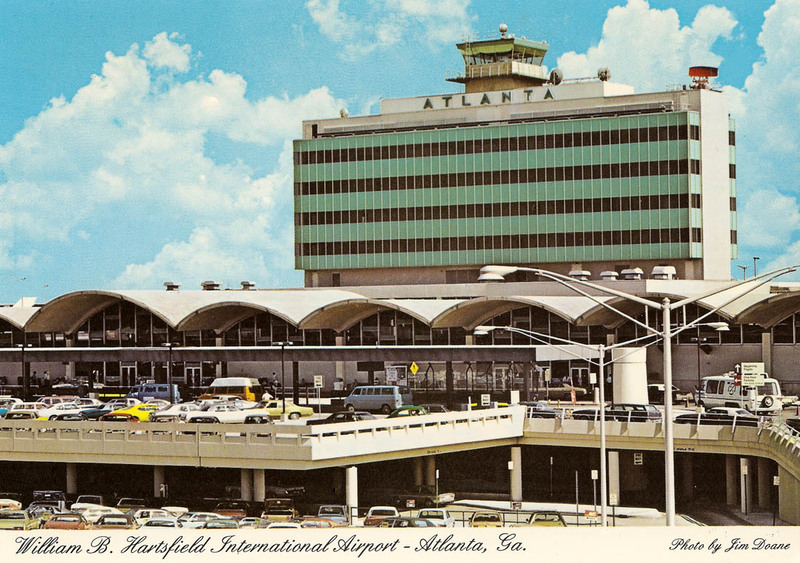 These next two postcard views from 1976-1977 show the considerable expansion that had taken place at Hartsfield's 1961 terminal in the seventies. You can see how the areas between the original ticket lobby and concourses had been completely filled in, adding more lobby space, security checkpoints and additional office space. A second level parking deck was built in front of the terminal with a second lane added for shuttle buses. 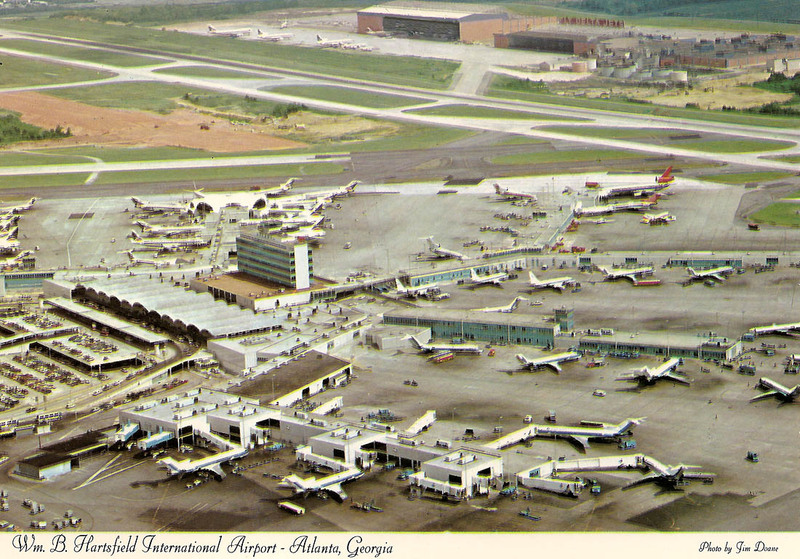 At the center of the photo, Northwest Orient (the two aircraft with red tails) had added second-level gates with jetways at the end of concourse D. At top center was Hartsfield's new control tower which was opened in the mid 1970s to allow an unobstructed view of the two runways on the south end of the field. It is now the site of the international terminal. For a larger view of this first postcard click HERE. In this view you can see that Eastern added a second level to three gates on the north side of concourse A (in the foreground, at bottom) and added double jetways for widebody aircraft. Also of interest on concourse A: at bottom left you can see two bright blue and white "mobile lounges" that shuttled passengers from the terminal to aircraft parked at remote positions near Eastern's hangar on the northwest corner of the airport. There simply wasn't enough space at the terminal to accommodate all the flights. 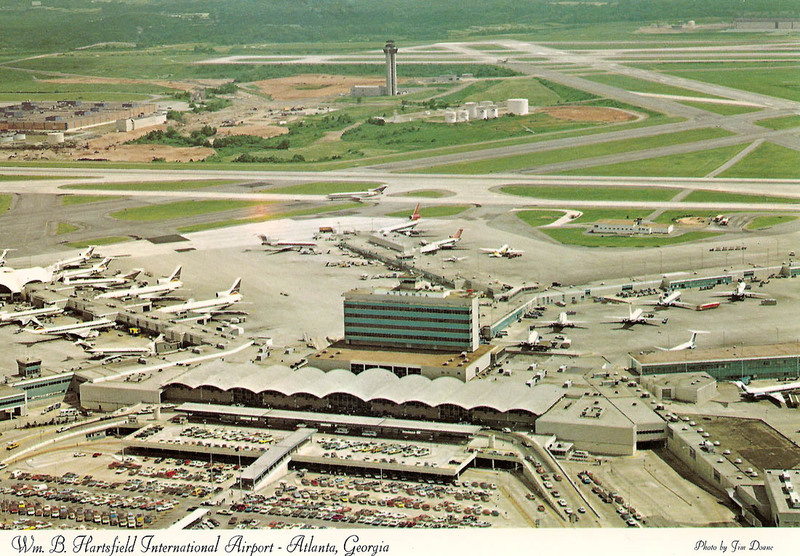 A great shot of the 1961 terminal circa 1976-1977 showing the parking deck and airport shuttle / taxicab lanes added earlier in the decade. Note the addition of new radar on top of the administration building.